Add a touch of European panache' to your open-air space. The 40 lb. European Patio Umbrella Stand features a classic floral design to secure any umbrella in refined style. This outdoor umbrella stand is made from resilient cast iron for the utmost in stability and durability. With its anti-rust primer and weather resistant powder-coat finish, this patio umbrella stand will withstand the outdoor elements beautifully from season to season. Several color options are available to coordinate with any decor. Protective feet on the base will prevent any marring of your deck or patio surface. Both long and short neck tubes are provided to ensure your umbrella stand fits nicely under your table. This is the final touch of flair you need for your outdoor environment. 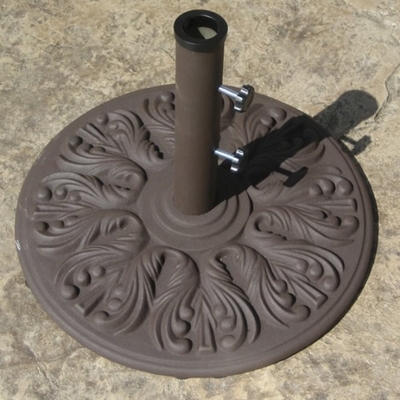 The cast iron European umbrella stand is as stylish as it is functional and sure to impress.